In our second episode of the RPM podcast we travel deep into the heart of Indian Country, to the crossroads of Canada—the city of Winnipeg. In this episode, we connect with some of Winnipeg’s rising stars, including Métis singer–songwriter Don Amero, Cree/Dene R&B singer IsKwé, Uptown Magazine’s 2011 best new solo artist, Anishinaabe hip-hop artist Lorenzo, the hyper-connected and highly influential Aboriginal music promoter and events producer Alan Greyeyes, and APTN anchor Dana Foster, who recently relocated to Winnipeg from the west coast. We find out what makes Winnipeg so…well…wonderful, and discover how the local Indigenous music scene is exploding with talent while being grounded in community and industry support. We also can’t forget to shout out the talented hip-hop artist Young Kidd, whose anthemic track about his hometown, “Wonderful Winnipeg”, opens and closes the episode. 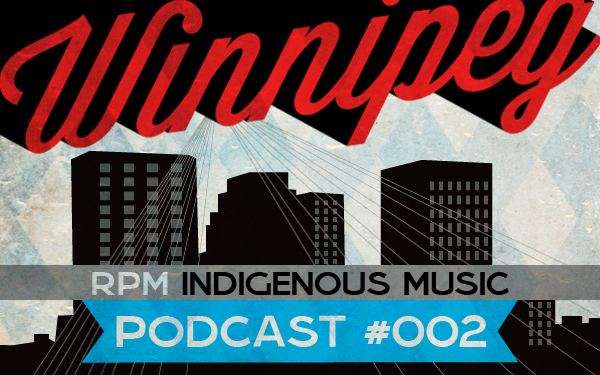 We couldn’t showcase the diversity of ‘Peg City’s Indigenous music scene in a single podcast, but watch coming RPM YouTube Playlist – “Winnipeg” for video selections and, check out the feature editorial from Julie Lafreniere on the rise of Winnipeg’s Indigenous hip-hop scene. What do you think of Indigenous music in Winnipeg? Drop us a comment below. We’d love to hear your thoughts. Photo Illustration: Thanks to the talented Joi Arcand for her great rendition of the Winnipeg skyline and the Esplanade Riel bridge. Great podcast RPM! Keep up the great work! I think the indigenous music in Winnipeg is awesome! I wish we had such a rich musical culture going on in the United States.